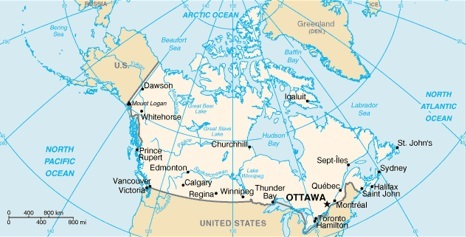 Canada is a large country (the 2nd largest in the world in terms of area) located in North America. The country has coastlines on the Atlantic Ocean, the Arctic Ocean, and the Pacific Ocean, but land borders only with the United States of America. There are actually two different and borders with the US: a long Southern border with the contiguous 48 states of the US, and a border in the Northwest with the American state of Alaska. The population of Canada was around 33 million as of 2007, and growing fast. Some of this population growth was coming from natural growth, but the majority was due to immigration, because Canada has the highest per capita rate of immigration in the world. Most of Canada's population live within 100 miles (161 kilometers) of the southern border with the US. 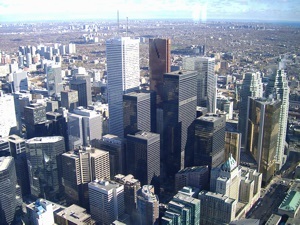 Major population centers include the capital city Ottawa, and the country's largest city, Toronto, which has a population of around 2.5 million people living in the city, and a total of about 5.5 million living in the Toronto metropolitan area. Other major cities in Canada include Edmonton, Montréal, Vancouver and Winnipeg. Canada has a developed free market economy and one of the highest GDPs per capita in the world. The country is home to a large primary sector which includes mining, metal and oil extraction, and logging, important manufacturing exports, a world-leading wheat producer, and is a net exporter of energy. Canada is member of the G7, and has had a free trade agreement with the US since the late 1980s, which later led to the NAFTA (North American Free Trade Agreement) with US and Mexico in 1994. There are many reasons to visit Canada. These include the exciting and multi-cultural cities, and outdoor activities such as golf, hiking, and skiing. DK Eyewitness Travel Guide: Canada will lead you straight to the best attractions this country has to offer. The fully updated guide includes unique cutaways, floor plans, and reconstructions of the must-see sights, plus street-by-street maps of Toronto, Montreal, Vancouver, and other historic Canadian cities and towns. Discover Canada region-by-region, from rural coastal villages to flat prairies and teeming metropolises. This fully updated guide provides the insider tips every visitor needs, such as the best scenic viewpoints of Niagara Falls and the Toronto skyline, highlights and maps of Canada's national parks, and scenic driving routes through the country. Brand-new hotel and restaurants listings including DK's Choice recommendations. With hundreds of full-color photographs, hand-drawn illustrations, and custom maps that brighten every page, DK Eyewitness Travel Guide: Canada truly shows you this country as no one else can. Covers Vancouver, Toronto, Montreal, Quebec City, British Columbia, the Rocky Mountains, Nova Scotia, Prince Edward Island, Alberta, Newfoundland, Banff, New Brunswick, Yukon Territory and more. The Rough Guide to Canada is the ultimate travel guide to this immense country. In full colour throughout, with clear maps, detailed coverage, suggested itineraries and regional highlights, there are independent author recommendations for hotels, restaurants, cafÃ©s and bars from Toronto and MontrÃ©al to Vancouver, and from the east coast to the far north. The Rough Guide to Canada is also packed full of practical advice on exploring Canada's untamed wilderness, from hiking or skiing in the Rockies to canoeing through British Columbia's lakes, and from whale watching to looking out for grizzly bears. Whether you're camping in one of the many beautiful national parks, heli-skiing in the mountains or going in search of the northern lights, this book will give you all the practical advice you need for an amazing adventure. 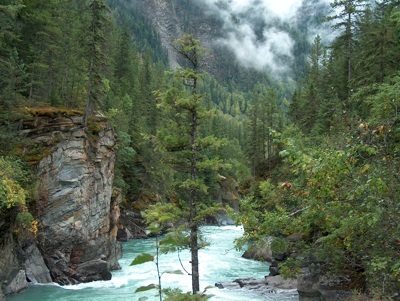 Make the most of your holiday with The Rough Guide to Canada. From flower-filled alpine meadows to cosmopolitan cityscape, you can craft your perfect adventure with Moon Atlantic Canada. Activities and ideas for every traveler: Kayak to an uninhabited island for a picnic lunch, or sample local oysters at waterfront restaurants. Follow the Cabot trail or the Irish Loop to enjoy stunning scenery out your car window. Hike the great outdoors or bike through beautiful UNESCO protected towns. Stay at quaint colonial inns, or camp out under the stars. See if you can spot one of the world's rarest whales, or indulge your literary side by visiting sights from Anne of Green Gables. With Moon Atlantic Canada's practical tips, myriad activities, and an insider's view on the best things to do and see, you can plan your trip your way. Visiting just one province? Check out Moon Newfoundland & Labrador or Moon Nova Scotia, New Brunswick & Prince Edward Island. Expanding your trip? Try Moon Vancouver & Canadian Rockies Road Trip. This Canada Guide is now available on paperback - So what are you waiting for?! We think youâ€™re hella lucky to be going to Canada and this guide will let you in on all of the countryâ€™s travel secrets so you can have the best possible trip in places like Toronto, Quebec, Montreal, Ottawa, Vancouver, the Canadian Rockies, and more. Looking for a guide focused on Vancouver? Check out Lonely Planet Vancouver guide for a comprehensive look at all this city has to offer; or Pocket Vancouver, a handy-sized guide focused on the can't-miss sights for a quick trip.